Law enforcers were granted full "freedom of action" in relation to those who support Ahtem Chiygoz on September 11. Today, on September 11, the Kremlin-controlled Supreme Court of the annexed Crimea in 2, Pavlenko Street passed sentence on Deputy Head of the Mejlis of the Crimean Tatar people Akhtem Chiygoz. The meeting started at 10:00. 10:20 - The so-called Supreme Court of Crimea fully supported the accusation against the Deputy Chairman of the Mejlis of the Crimean Tatar people Akhtem Chiygoz. The prosecutor's office requested 8 years of imprisonment, QHA correspondent reports. Currently the lawyer's statement is expected. 10:01 - People gathered outside the court building and held the dua (read the prayer). 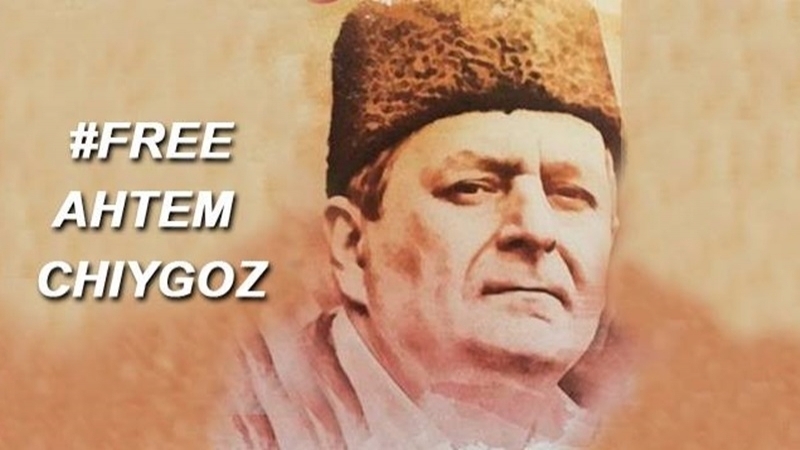 10:00 - "I want all the people to understand that this is a sentence not only for my Akhtem, but for all Crimean Tatars, I'm proud of him," father of Akhtem Zeitullah Chiygoz said. 09:40 - Ayshe Umerova wrote that besides lawyer Polozov, Elmira Ablyalimova would also be in remand centre with Chiygoz. 09:39 - Nikolay Polozov said that he would be with Akhtem Chyigoz in the pretrial detention center during the announcement of the verdict. 09:23 - Elimira Ablyalimova published photo on Facebook showing what was happening around the court building. 09:22 - lawyer Nikolai Polozov informed that the police were deployed to the Supreme Court of Crimea, they forbade the movement of cars along Pavlenko Street, the area in front of the court was fenced off, metal detectors were installed. He also noted that the verdict would be passed in the smallest courtroom for 10 people. 07:40 – Zair Smedlyaev said that today activists would come "to support Ahtem Chiygoz and show the true face of this power, its attitude to our people!" Reference: After 150 meetings, on August 1, the occupying judges completed the investigation into the case of Akhtem Chiygoz. The Deputy Head of the Mejlis of the Crimean Tatar people, Aklhtem Chiyhoz, was detained in January 2015 for participating in a rally in support of the territorial integrity of Ukraine in front of the building of the Verkhovna Rada of the Crimea on February 26, 2014. At that time, the protesters were opposed by pro-Russian activists, including the "Russian Unity" party. The Russian authorities of the annexed Crimea accuse Chiygoz of organizing riots.